The last time we heard of Kanzatu-Nzatu was when we were reviewing their Square World app targeted at the diaspora. 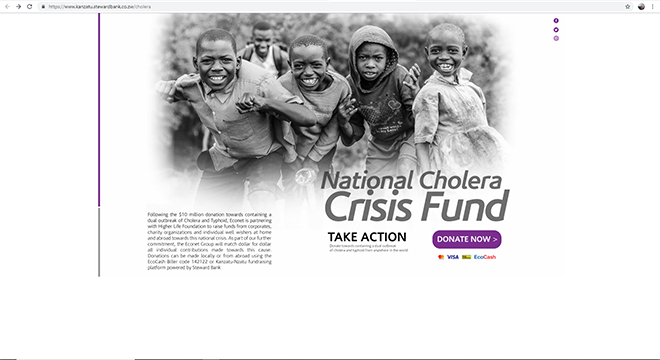 Now with the imminent Cholera epidemic that has struck Zimbabwe, Steward Bank took it as an opportunity to test their crowdfunding platform and get to find out if a crowdfunding culture exists in the county. 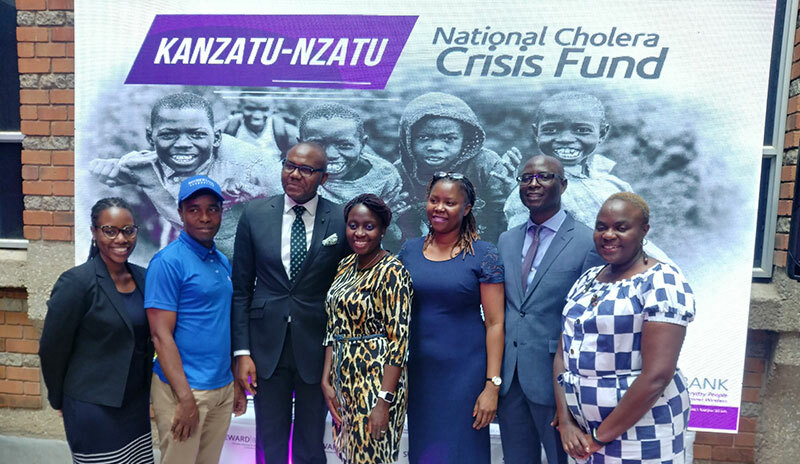 This Kanzatu Nzatu crowdfunding platform was developed by Steward Bank and is enabling anyone from anywhere in the world to contribute. It supports EcoCash, Zipit, Visa and of course Steward Bank for those that bank with them. First you click on the link to the page which you can access HERE. The page opens and the lower right corner will be furnished with a purple ‘DONATE NOW’ button that needs a click. You are sent to another page showing the target amount, the amount raised so far and the number of contributors. 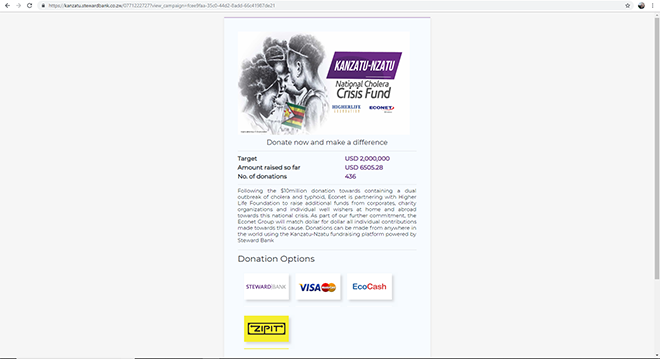 Below those are the methods of donating which are EcoCash, ZIPIT, Steward Bank and VISA. Click on your preference. If you were counting that’s just 4 clicks to the promised land. This platform went live a day ago and during the 45 minutes that the launch was taking place, the platform managed to raise over $500. At time of publishing this article (36hrs after it went live), the platform has since raised $6541.28 from 439 contributors. Doing the math it translates to about $182 per hour and if the momentum maintains it will take us 10 935hrs or 456 days to reach the $2 000 000 target. Yes that is a whole year and just over 100 days. Certainly are curious to find out how this will shed some light on the perception of crowdfunding in Zimbabwe. If it does take off it really could have a meaningful contribution to the startups in Zimbabwe as a convenient way of funding their projects. Think of it as investing in your own people.